With the exception of birth records, which are only considered public when older than 110 years or more, all records listed with the Isabelle County Clerk are open for research. Marriage records are listed from 1859, deaths from 1867, and divorces from 1900. In addition, naturalization records are available from 1861 until 1965. To obtain or view birth records younger than 110 years, researchers must be able to prove relation to the person in question, and the County Clerk staff will perform any searching that is needed. Space at the research area is limited to two individuals at once, and the office operates on a first-come, first-serve basis. Anyone interested in learning more is encouraged to email the Clerk's office at clerk@isabellacounty.org. 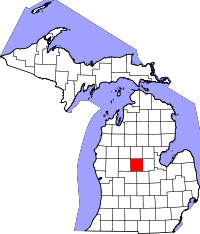 Isabelle County, named after Isabella I of Castile, the Queen of Spain, was one of many Michigan counties renamed by Henry Schoolcraft, a mid 1800s scholar. Note: Will name search mail requests for $5.00 for 10 years. Need exact name, doc approx date, doc type; need name of person requesting search, name of company and how to return. Add'l $5.00 if faxed back. Fees must be prepaid.